Upgrading to the latest version of SQL Server is often seen as a comprehensive and difficult project. Management often fails to see the benefit for migrating to the latest version and your end users aren’t interested in the extra testing. As a DBA you need to come up with a plan that earns both management and end-user support. This webcast will cover all the information you need to collect and consider before, during, and after upgrading to SQL Server 2016. 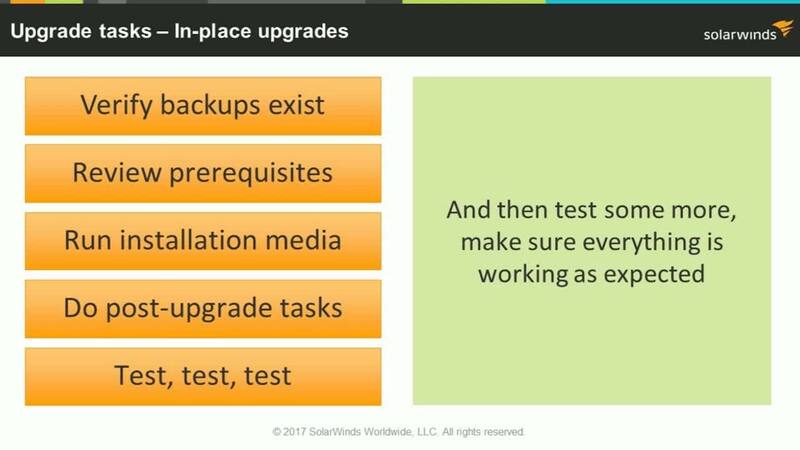 Further, we will discuss licensing, upgrade approaches, and building out your own upgrade checklist. We will cover pre-upgrade tasks, how to perform the actual upgrade, and we will review a list of post-upgrade tasks you will want to do before you turn the server over to your users for testing. If you feel stuck on an older version of SQL Server, watch this webcast to understand the features and benefits of SQL Server 2016 that will justify your upgrade project.